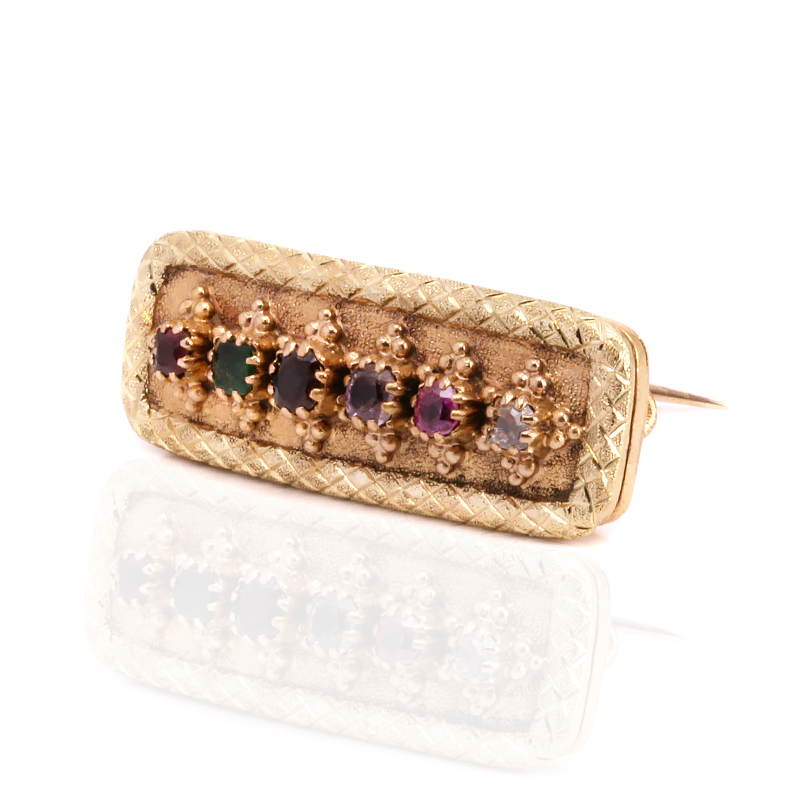 Product code: ES8194 Categories: Antique, Antique Brooch. Acrostic jewellery is the term given where the first letter of each gemstone “spells” out a word, such as can be seen here in this very rare antique Regard brooch with a hidden compartment. 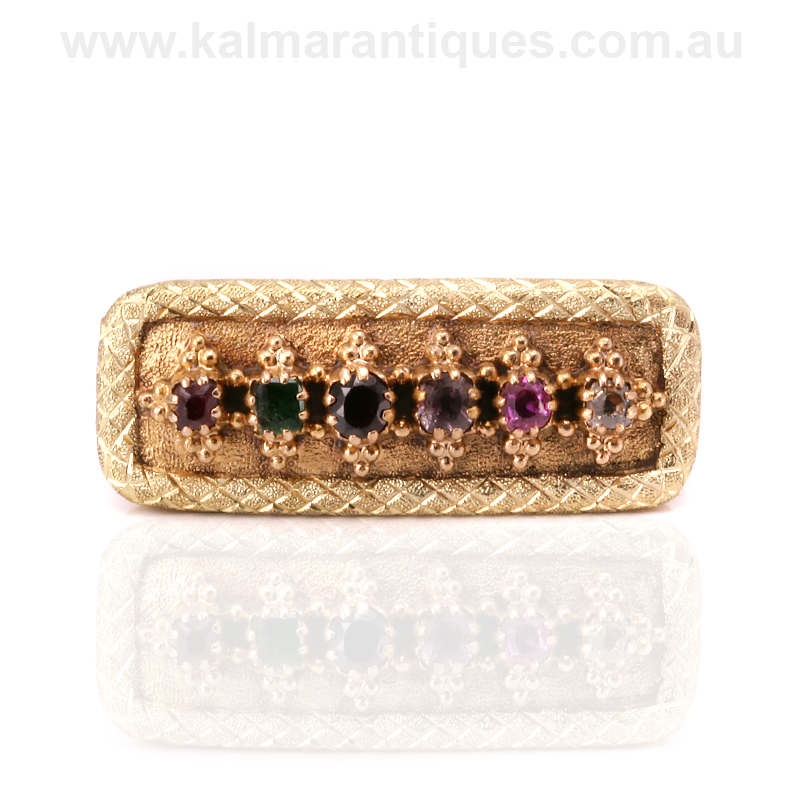 Dating from the mid-Victorian period of the 1870’s, this Regard brooch was made in 18 carat yellow gold and has set in line a Ruby, Emerald, Garnet, Amethyst, Ruby and a Diamond spelling out the word “Regard”. Often given as a romantic gesture to a loved one, it was a wonderful way for a gentleman to show his love to someone without actually saying it in the traditional sense, and only if this romantic brooch to talk of its history, what a wonderful story it would tell. Measuring 27.4mm across by 10.7mm the border surrounding the gemstones is just as beautiful as the sentiment and then this top part hinges open to reveal a secret compartment to place a lock of hair. With all the romance and charm of a bygone era, this antique Regard brooch is not only in perfect condition even after 150 or so years later, but will always continue to be such a wonderful talking point. Acrostic jewellery is a form of jewellery where the first letter of each gemstone ‘spells’ out a particular word or meaning. This form of jewellery goes as far back as the 1700s and was thought to have originated from French jeweller Jean-Baptiste Mellerio (1765-1850) who made jewellery for Marie Antoinette and Empress Josephine. This form of jewellery quickly became popular, and came across the channel to be embraced by many English jewellers. 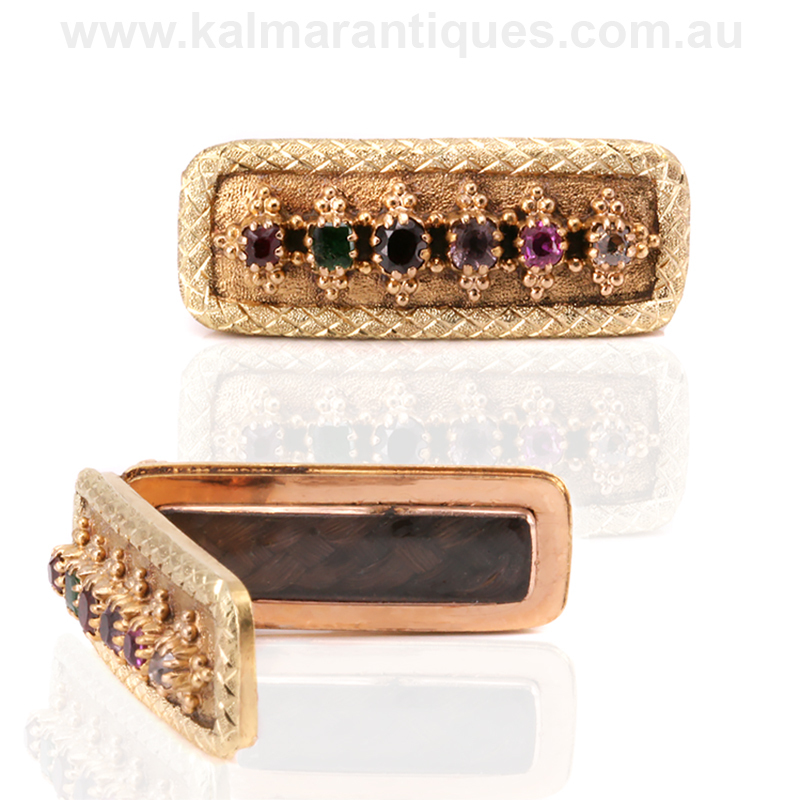 However, acrostic jewellery became most popular during the mid-19th century during what is known as the Romantic era. In France at this time the common words found in acrostic jewellery were often ‘souvenir’ (remembrance) and ‘amitié’ (friendship). In England, this form of jewellery is most often be found in brooches and rings known as a ‘regard’; which would feature a ruby, emerald, garnet, amethyst, ruby and a diamond, or perhaps the word ‘love’ would be made, the piece being set with a lapis, opal, vermeil (an old name for hessonite garnet) and emerald. Other romantic sentiments found in acrostic jewellery can also be found in the form of ‘dearest’ and ‘adore’ jewellery. J’adore (love), was spelled out in a ring with jacinth, amethyst, diamond, opal, ruby and emerald gemstones, set in that order. Sometimes, the gems would be inter spaced with seed pearls representing tears.